Tired of your old guild not progressing fast enough? Come check out our guild, we have a few openings for established and focused players who are eager to take down the HAAT with us. Please be 18yrs or older and be able to read English (crazy I have to write that). We use Discord to communicate and coordinate attacks in HAAT. We are not affiliated with any alliances so you can rest knowing that the guild will remain intact. The leadership team has been together for a long time, long time. This is the nAAT, keep this out of here. Planet Moraband, home of the dark lady of the Sith, Andain. Only2, is looking for for a few more members. We are 47/50 currently. We do require Discord usage, and observe 24 hour sacrifice (0 damage attacks) on Pit. H-Pit, AaT. We have a great base of players and making pushes at HAAT, and ready for Territory Battles. We're Casual but committed to progressing as a guild. Most of our members have been together for over a year now. Rancor starts at 10am or 10pm, and Tank is launched at 5am EST. AC 729-834-816. XJedimindtricksxG2 is in search 4 new members to fill out our roster to replace some inactive players. Who are we - We are an offspring of a guild running both heroic raids. Until recently we were getting some assistance in Heroic Rancor from our parent guild, but have been doing it on our own for a month. We run Heroic Rancor each Monday and Thursday launching at the guild reset (7.30pm eastern), and normal AAT, completed in 2-3 days. Rancor we send in 1 person (rotation) to solo p1, then it is a 24 zero damage for over level 80, under 80 are free to hit away to take advantage of the door. Guild requirements - follow rancor rules, and game activity, that is it. We welcome players of all levels, currently we have 21 who are 85, 19 between 70 and 84, and a few in the 20 to 50 range. We have regular gear gifters to help our new players gear up easier. Come check us out, Rancor launches tonight, so you will be straight into Han Solo shards. Need 1. HAAT is at 8pm. Rancors rotate between 12p and 9pm. All times US Eastern. All raids have 24 hour zero damage. 600 tickets a day mandatory. This guild is part of a multi guild group. If you're roster is top tier, you can also be considered for the mega guild roster list we're forming in prep for Territory Battles. Chat is on Discord and is required. I'm an officer from an older guild that has fallen on tough times. We recently did a purge of members that just weren't cutting the mustard, and by "mustard" I mean Raid tickets. We are recruiting new members to get us back on track. ConcordDawn guild is currently up to 47 members strong. We are eating Heroic Rancor for breakfast and knock out normal AAT in about 24 hours. We are focused on getting over the hump for Heroic tank and need some new blood to revitalize us. (We stalled about 1/2 through Phase 3). We run a 24 hour no damage phase roll call on Rancor so everyone has a chance to get on the leaderboard. After that it's FFA. For Tank we do a FFA but only allow one squad per phase (to help us focus on developing phase-crushing squads for HAAT). Raid times start at 9PM EST and we raid as often as we can generate the tickets. Our preference is for players with a deep roster and an unabashed addiction to play. Looking for daily players that contribute 500-600 raid tickets per day. We understand of course that our digital lives should play second fiddle to our real lives. Guild communication is both in-game and on Discord. KøR Academy Is looking for new players level 22-85 trying to develop & get ready for HPIT & HAAT. We currently are Running T/4/5/6 every other day & are doing NAAT like for players who want to have fun yet learn in the process. If your serious about the game looking to sharpen you're skills let me know asap! We are the fast way for new players & older players to get you ready for HPIT & HAAT hands down! Nightbrothers of Dathomir X is a friendly & active Guild. We are part of The Dathomir Alliance. Nightbrothers of Dathomir X are looking for active members who enjoy the game, invested upon becoming better and can participate in all our Guild events. We run T5 Rancor Raids (2:00 pm CST) and Normal Tank Takedown (10:00 am CST) As our members improve so will the Raids. Guild rewards reset at 7:30 pm CST. We use the LINE app and want new members to join our LINE group as well. It is not mandatory but strongly encouraged. We are a Global Guild but predominately English speaking. Join us & grow stronger together! Apply now or send me a private message. Die Gilde Alu's kleine Farm ist ein Trupp von aktuell 18 ambitionierten, aber dramafreien Spielern. Wir suchen Spieler ab Level 65, die täglich ihre Gildenpunkte für das Team beisteuern. Level 7 Toons sind wünschenswert. Aktuell spielen wir Rancor auf 7 und AAT6. We are a UK based guild that raids every few days at 9pm UK time. We have a 24 hour period of 0 damage on the rancor with one team allowed at 9pm the following day. We are also looking for help in HAAT. On our most recent attempt we were only 10% away from completing it but due to the lack of members we could not. About Our Guild: Our guild has been around for about a year now. We currently have 46/50 members, having purged a couple players who couldn't comply with raid rules. All but one of our members are level 85. We've got a good mix of high-end players along with a number who are developing their teams. Everybody gets along. We've got a lot of generous donators, and our crew is great with roster-building advice and battle-strategy. We're looking to fill out the rest of our guild with active, impactful players. Our members average approximately 29 7-stars each, and just over 910,000 Galactic Power per member. The daily refresh is 6:30 p.m. pacific. Roster Requirements: We don't have super-strict requirements, but we do want to make sure that anyone joining is a good fit for our guild, and that our guild is a good fit for each member. To that end, we ask that any new recruits have a minimum of 10 7-star characters and a minimum of 650,000 total Galactic Power. Come and join us every single person in guild is pretty active and dedicated to getting both heroic and territory battles on farm. We have heroic rancor on farm and were 2 weeks away from HAAT. Big group of us decided to leave last guild because of inactive leader and working our way up on to starting HAAT. If interested my ally code is 152-374-864. Give me 2 weeks and if doesn't do it for you can leave. Also discord is a requirement for us moving forward. Guild name is Aka'liit. Give us a chance we have a good community and main players have been playing since 2015 . Rest of group that moved over have been playing 4-8 months with some since release. SkyMaulShoppers is a new guild recruiting active players of all levels. We're currently able to beat the tank with only 5 people doing most of the damage. We really just need help earning tickets every day. My ally code is 365 926 315, if you're interested. We are The Half Moon, a friendly guild focused on growing our squads and raiding, while understanding that real life happens. We slam the NAAT in 2 days and Heroic Rancor in a matter of hours. We are currently clearing 2-3 Heroic Rancors per week, with 24hr zero damage rule. We are currently clearing 2 normal AAT raids per week, clearing within 2 days of launch - building towards HAAT! Only roster requirement is that you have one 6* and one 7* toon to raid. The Guild is comprised of people from all hemispheres and from various continents. We follow 2 separate raid times to accommodate everyone. We use Discord to chat and coordinate. Discord server link will be sent upon joining the clan. Send me a PM on here or ally request me with no guild status and you will get an invite. Hey there , fellow galatic heroes! 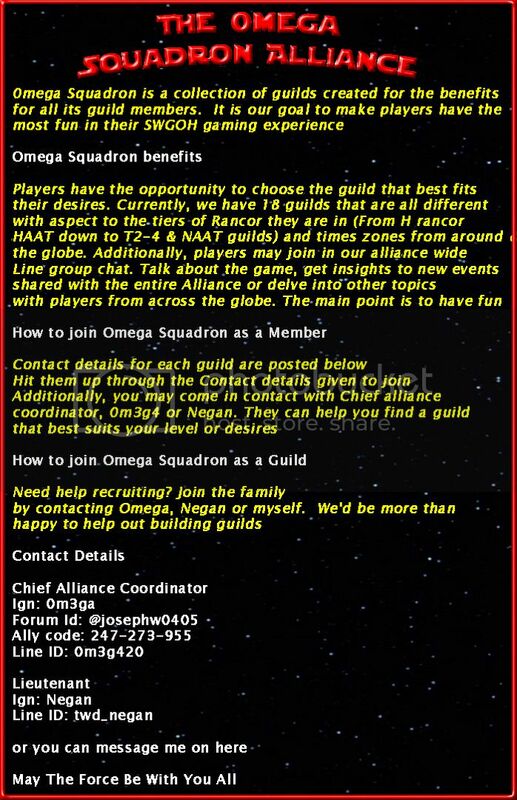 Our guild is looking for a couple new members to replace 3 inactive ones. We haven't recruited in a while since we were sitting with 50/50 But a few have since stopped playing. We have a very strong group of guys who are all really active, helpful and friendly. There are no dictators. We average 24k in daily raid tickets. Our guild reset is 7:30pm EST and that's when we launch our raids. As of now we have a 0 damage for 24hrs for anyone high than lvl82 In our T7 and AAT raids. The T7 raids were only lasting 35 minutes and the AAT was taking 10 hours after being launched. So collectively we decided that we want our mid/low level guys to have more time to get some hits in to enjoy the raids too. We also have players from all over the world so having it delayed helps everyone. This is literally our ONLY "rule". We have a chat group on the LINE which is not mandatory but it's really helpful and fun. All we want is friendly people to grow with and get ready for the up coming territory battles. Let me know if you're interested. You'd enjoy this guild I'm sure. We want any and all to come join. No restrictions, whale or guppy! Message me here or add me on LINE. Relaxed and fun group that is mainly F2P with a few P2P members and everyone likes to help out lower level members with gear, knowledge and cookies! Everyone also loves funny memes! To Join: Ally Request in game (157-941-434), message me on Discord (Pier007#6736) or PM. Looking for 8 active players to complete our ranks. We run Heroic Rancor and NAAT 2-3 times a week. Close to completing HAAT. We are laid back and helpful group just looking for active players who want to grow. Please be able to see texts or Join our discord group. The Z Nutt Tossahs (ZNT) is recruiting 5 new daily, active players to its ranks! We are a committed, friendly group looking to overhauling our roster in preparation for the HAAT and the new Territory Battle game mode. We welcome Level 78+ players (F2P or P2P) and are invested in helping new members refine their roster and find success in the Raids. We are Heroic Pit Raid Guild and are currently running NAAT Tank Takedowns. We have grown from a trio of three Star Wars “enthusiasts” into an international Guild with members from exotic places such as Canada! Our core members hail from the USA, Brazil, Portugal, Turkey, and, of course, Canada (we have a lot of Canadian members). Our common language is Galactic Basic (English) but we have members that speak fluent French and Portuguese. Our approach to the game is enthusiastic; we want General Kenobi & all the new characters the Territory Battles may offer! We have online resources to help players develop their roster in a productive, personalized manner. A majority of our members are F2P with some that occasionally spend a few bucks. Our Guild Activities reset at 7:30 pm EST. Our Pit Raids run on a rotation beginning with a T5 that is reserved exclusively for developing members, all established members earn rewards for their zero point contribution. Following the T5 we launch three T7/Heroic Rancor Raids. A mandatory 24 hour Zero Damage Period applies to all of the T7 Raids. Once this 24 hr period concludes members may battle at will. We typically run two Rancor Raids a week starting at 11 am ET or 10 pm ET. If tickets are available we will run a BONUS third raid. NAAT launch whenever we have the requisite tickets, typically running twice a week. Access to Discord is strongly urged, but not required. For members not comfortable using external methods of communication they can stick with the in-game chat. While we enjoy playful banter, please be polite and respectful of others. We're all different individuals from all over the world, with different views on all kinds of subjects. By all means, discuss, but keep it cool and respect differing opinions. 600/600 tickets per day is a loose requirement. While all our members are encouraged to contribute the maximum ticket amounts, we know folks have lives outside of Star Wars. (I know, but it happens.) We keep track of how many daily raid tickets everyone contributes. Members that are found to be underproducing will receive a warning. If their inactivity continues, they will be removed from the Guild. Participation in ALL raids is required. Communicate with the officers if you aren’t able to participate in scheduled Raids. Level 78+ player. Ideally, you have an SWGOH.gg profile, but it isn’t necessary. You should have at least one full 7-star team. Be an active, daily player. We will consider players that are of a lower level, and/or with less 7-star characters if said player is extremely active and progressing fast. Contact Zag Nuttz#1519 on Discord or DM me with your questions or interest! Oceanic Knights is an Aussie guild looking for more, we have an opening of 17 spots and are looking for more to help us get to HAAT. Doing T6 AAT in 12 hours so we are close with the team we have now so some extra people will help a lot! No Refuge is looking for you! Currently we have 46 members, so we have 4 spots for daily players! We are focusing on applicants who have at least one 7* toon, and can produce daily tickets =D. We are looking to fill our guild with active, fun players! We provide a fun growing and learning environment for new players as well as the seasoned! We are looking for daily players who can contribute and can participate in Heroic rancor, twice a week, and can help prepare for heroic tank and be ready for battlegrounds, so participation is a must. For those of you who want more experience, we do use the in game chat and also use an off game chat (Line) that is mandatory and super useful, and it's super easy to use. We raid twice a week, sometimes 3 times, and announce them in advance. We are also looking for HAAT officers. Those who can keep track of stats, damage, each player makes, is welcome, and an officer who can keep track of team comps and make suggestions to complete the HAAT raid. Most of our guys are level 80s, some are lower, all are super helpful. If any of this sounds good, drop me a friend request in game! Raids: Heroic Rancor / AAT normal mountain time. or you can message me on here. Seeking two more members for HAAT push. Friendly guild, seeking active and developing players level 85. Ideally committed to see HAAT on farm and TB success. We are a guild of 30 players looking to fill in the gap and progress more towards the HAAT raid. We do not require you to do 600 tickets a day but ask that you do at least 400 and I do check. I understand life happens sometimes but do try to get at least 400. The Galactic Uprising is a midcore guild looking to broaden our horizons. The 24 hour 0 damage rule is in place for the heroic Pit raid. We are currently still on the T6 AAT, but with more people, we have a better chance of clearing the HAAT. Must be at least level 80 with ten 7* characters at gear level 8 or beyond. Boot policy is 2 weeks then you're out, unless otherwise stated you're going to be gone, then we'll work something out. Discord is available and encouraged. Also, I do boot if you damage before everyone else on heroic pits. Who are we looking for? People with at least six 7☆ characters. People with characters at gear level 8 that need to shatter that ceiling to get to gear 9 and beyond and who do play as much as they can. Thank for you taking the time to read this. My information is as follows. The Mol Eliza Fan Club is looking for additional new members. We're doing Heroic in the Pit against the Rancor, but we're not yet ready to complete Heroic in the Tank Takedown. One tier below. The Rancor raid has a strict 24 hour 0 damage rule and then any may fully join in. Would love to have you onboard. Aur0ra Guard are looking for 5+ players to join us as we approach Territory Battles and HAAT. The latter of which we are very close to, with a few Zylos being built to solo Grievous. If you are on the cusp, or eager to find out, now is the time to join. We're UK based, 45 members strong and run a successful 24hr Zero Point Rancor system. It was difficult getting there but we did it, and I'm very proud. Because of this we are no longer accepting conventional requests. We've got a bit tired of ppl marching in and hitting big, having not bothered to read the instructions. All new entrants will have to come through LINE, where we have a portion of us chatting strategy, characters, and fun. Once I've made sure you're clear on the basics, you're in! We've got big things planned. Some great players. And a nice chilled vibe. We want to excel but not at the cost of enjoyment. If you're a lvl85 addict then pls contact me here or directly on LINE. My username is mathisrarg. #And Now our Watch has Ended# 25 Person guild due to reform of a long time AFK leader. Solid core of 85's with most players above 74. Level 70 Plus with an active Outlook for the game (600 / 600) not essential. Must use Discord for Chat and have a positive outlook to progress in game towards HAAT. Swgoh.gg account preffered but not required. Looking forward to hearing you. Grab me either the forum or Discord.